Thank you for considering our honey to sweeten your life! 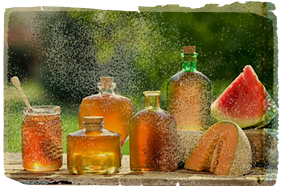 Here are a few tidbits that show our honey is top notch and some of the best you’ll ever taste! Our honey is raw and unfiltered! We never over heat our honey nor do we filter. We simply use a cheesecloth to strain and remove large debris but it is not filtered. Therefore all of the natural enzymes, pollens, amino acids, vitamins, minerals etc remain intact. Our honey is a very thick consistency. This means that nothing was added to the honey and it was not overheated to prolong the crystallization process like a lot of grocery store brands are. Honey should be nice and thick. Not thin and runny like maple syrup! Our honey is KOSHER certified. Our honey is not pasteurized. All honey is Gluten Free and Fat Free. Natural and raw from the hive! Because our honey is raw, it will eventually granulate or crystallize. The good news is that honey never spoils so you can still consume it or put it in a pan of hot (not boiling) water to re-liquify. Our honey is not organic. We can not claim our honey is organic because there is no such certification here in the US. Buyer BEE-WARE if you are buying organic honey. It is either a falsehood or the honey comes from a different country such as Brazil, Mexico or Egypt. Please don’t pay extra mulah for something that doesn’t exist!